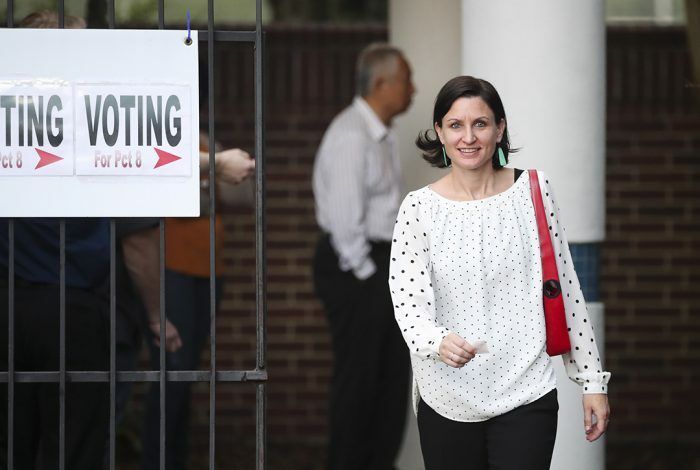 A voter walks out of a polling station this morning in Houston, Texas. Photo credit: © Wang Ying/Xinhua via ZUMA Wire. This election cycle, Texas has done little to rehabilitate its reputation as one of the worst states in the union in terms of obstacles its citizens face in order to vote. In September, Northern Illinois University’s political science department ranked Texas 46th out of 50 in a study that gauged 33 polling variables in each state, including voter registration deadlines, voter ID laws, and early voting. What’s more, Texas has been jogging backwards at a rate faster than most other states, dropping from 14th in 1996, a rate of reversal surpassed only by New Hampshire and Tennessee. It’s a Republican-dominated state that represents some of the most contentious electoral developments in recent years, including its 2011 restrictive voter ID law, which two federal courts subsequently ruled intentionally discriminated against black and Latino voters. The state has also faced federal judicial reprimand for its redistricting, found to have been gerrymandered to favor Republican dominance. This cycle, incumbent Gov. Greg Abbott (R) has maintained a consistently commanding poll lead over Democratic challenger Lupe Valdez, but Sen. Ted Cruz (R) has faced a surprisingly strong challenge from Rep. Robert “Beto” O’Rourke (D). Also at least four of the state’s heavily gerrymandered 36 House seats are seen as vulnerable to flipping from Republican to Democratic — Republicans currently hold 25 seats, Democrats 11. In October, with the backing of the NAACP’s Legal Defense and Educational Fund, five students from Prairie View A&M University (PVAMU), a historically black college in rural Waller County, 50 miles northwest of Houston, sued the county and its election officials for alleged restrictive early-voting practices that “are a continuation of Waller County’s decades-long pattern of unconstitutional racial and age-based discrimination against Black student voters at PVAMU,” according to the suit. The county originally offered only three days of early voting on campus and another two days at an off-campus community center in Prairie View, with no voting after 5:00 PM or on weekends. By comparison, in the majority-white city of Waller — whose population over 18 is half that of Prairie View’s — there were 11 early voting days, including weekends and after-hours voting. 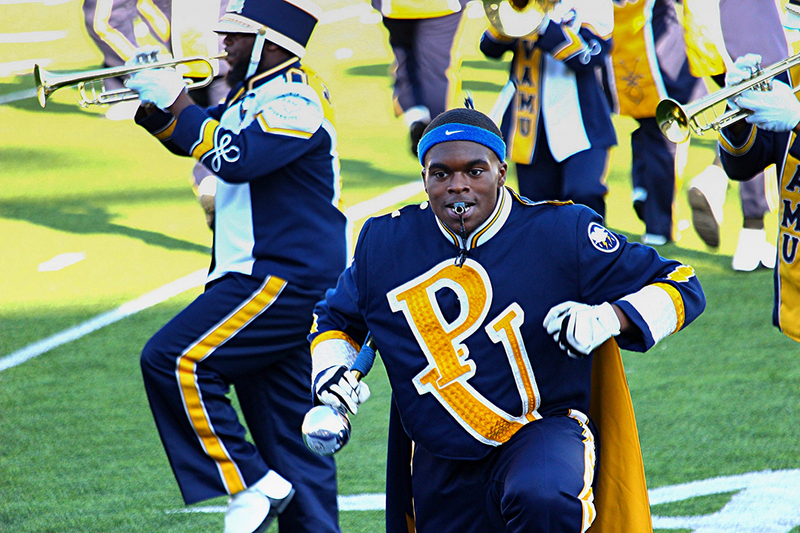 Students at Prairie View A&M University (PVAMU), like this marching band member, face more barriers to voting than their neighbors in Waller, Texas. Photo credit: 2C2KPhotography / Flickr (CC BY-SA 2.0). Under pressure from Texas Secretary of State Rolando Pablos, a Republican, Waller County added an additional day of off-campus voting and some hours on campus, but resisted calls for more equitable early voting. There was additional controversy just ahead of the state voter registration deadline on October 9, when Waller County officials required students to provide an additional “statement of residency,” which Mike Siegel, Democratic Party candidate for the 10th District in Texas (covering Waller County), said was “essentially putting up a barrier to the vote.” Again, Pablos intervened to persuade the county to reverse this move. In a similar campus case, Texas State University student voters in Hays County faced two-hour-long lines to vote during limited hours at the one on-campus polling site at the college’s LBJ Student Center. Under threat of a lawsuit from the Texas Civil Rights Project — on behalf of two Texas State students, MOVE Texas, and the League of Women Voters — the county commissioners added three new polling sites, including one on campus, plus two polling days and extended voting hours. “It was never the intention of the county to suppress any votes and we are encouraged that we have seen so many folks come out to vote,” Hays County Commissioner Debbie Ingalsbe told the Hays Free Press. There was certainly an element of surprise in the surge of students, and young people in general, coming to the polls. According to the Texas secretary of state, early voting by November 2 was up about 40 percent on average, but up by 508 percent among younger voters. Voting rights campaigners say the state’s arcane voting structure and rules, where each of its 254 counties oversee voting separately under their own rules and overseen by the county tax assessor, is an obstacle in itself. Also, people like Galloway are required to register in each county where they are working to get out the vote. Texas has been among the states that have reported irregularities attributed to the antiquated voting machines used in many of its counties, known as Direct Record Electronic systems (DREs), particularly those made by ES&S (formerly Diebold, otherwise known for its ATMs). “These machines were manufactured a long time ago, in a galaxy far, far away,” says Dan Wallach, a professor in Rice University’s computer science department, who specializes in election systems. There have been claims that the glitch has favored Republicans, although that has not been substantiated. 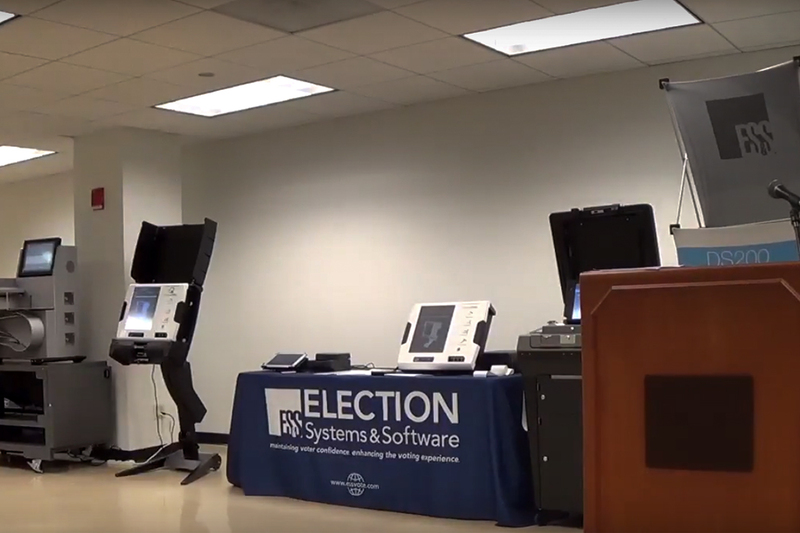 Election Systems & Software display. Photo credit: ChicagoElections / YouTube. There have been sporadic, anecdotal reports that voters at early-voting sites have been directly intimidated, but beyond that there is widespread agreement that the state’s voter ID laws — and particularly the efforts of Attorney General Ken Paxton to publicize the aggressive prosecution of them — have been designed to intimidate. “This big hoo-ha the AG is putting out now about how many people he’s arresting for voter fraud is a way of intimidating a group of voters, especially people of color,” says Grace Chimene, president of the League of Women Voters Texas. According to a Texas AG office press release last month, Paxton has prosecuted 33 defendants for a total of 97 election fraud violations, equaling the total prosecutions in the 12-year period to 2017. Paxton’s office was particularly keen to note its aggressive prosecution of a Mexican national — Laura Janeth Garza — who pled guilty to a number of ID and election fraud counts after stealing an American citizen’s ID, resulting in 180 days of jail time, a 10-year probation, $10,000 fine, and deportation. Chimene also points to state-funded billboards featuring a woman of color holding a passport and reading “What you need to vote,” implying that a passport, the most expensive and cumbersome of the seven acceptable IDs is required in order to vote. In 2016, the state’s warnings, plus litigation over voter ID, discouraged voters, advocates said. It was “the confusion factor,” says Gutierrez. “There was so much confusion that just ended up keeping a lot of people home.” This was backed up by a study by the Hobby School of Public Affairs at the University of Houston, which found that minority voters were disproportionately the ones who opted out casting ballots because of the ID controversy.